Create manicured lawns on your manicured nails this summer. Manicured nails and manicured lawns don't have much in common other than their adjective. 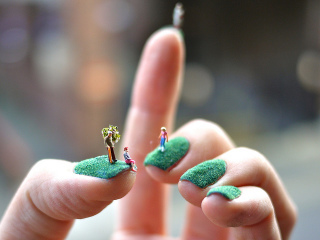 The two are way too different to ever be combined, or so we thought before Alice Bartlett created an adorable mini lawn on top of her nails. 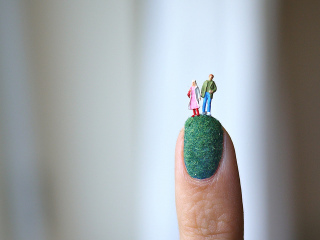 Her look is an innovative way to use green flocking and miniature people from the hobby shop. Photo courtesy: Laughing Squid If you want to give this look a try, you'll need to buy a few items. First, make sure you have clear nail polish or nail glue on hand. The "grass" needs to stick to something. Start by applying several coats of a green shade that matches your flocking. Coat with clear polish, and stick on your flocking. Attach the little figurines and trees with glue, and clean up any flocking that got away from you. It's a lot quicker to create manicured fingernail lawns than it is to actually cut the grass outside. Alice Bartlett's manicure is precious and hopefully inspires you to create a look of your own. Fun manicures require creativity and thinking about how to use old items in new ways. You can DIY this manicure in minutes.Maybe your lawn gets away from you for a bit (three inches high is a totally acceptable grass height), but your nails will be on point with this manicured style. Feel free to check out more of my beauty and fashion innovation blogs for ideas and new products. Explore The Random Rabbid Universes of "Rabbids Go Home"